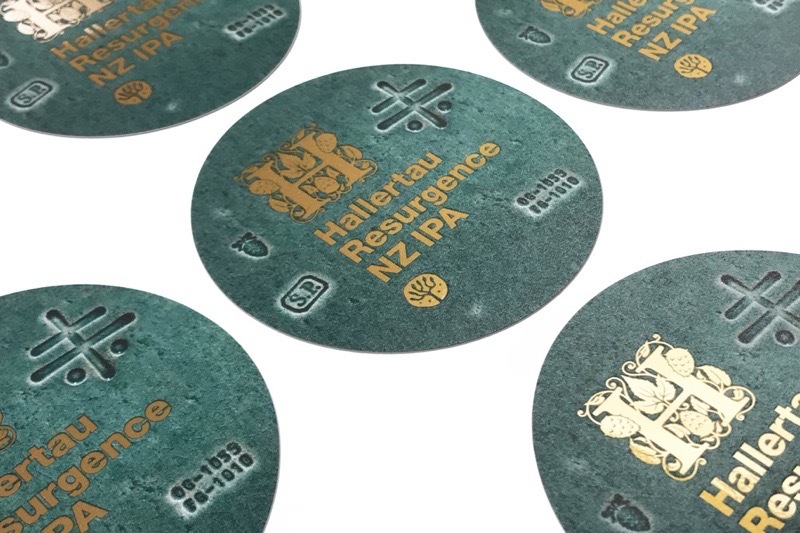 Hallertau asked us to produce a special gold foiled tap badge for the seasonal release of their Resurgence Strong NZ Pale Ale. Hallertau wanted this to match the gold foiled finish of their bottle labels but it was not practical to apply gold foil to the removable self-adhesive vinyl that we produce tap badges from. So instead we started with a metallic gold vinyl, then printed several coats of white ink to mask out the areas of the badge that should not be metallic. Then we overprinted this white mask with the coloured background before kiss cutting each badge to shape. We were really happy with how they came out.